Sew, Mama, Sew! asked about our fabric collections, and you know I couldn’t let that one pass! Here are my answers to their questions. *What do you usually sew? 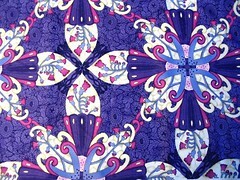 I usually sew quilts – small, medium, large, bed or wall, it makes no difference. I’m currently participating in a Flickr group that swaps mini quilts and it’s a blast because it gives me the opportunity to try something new without committing the next six months to it. When I’m not sewing quilts, I’m sewing bags. I’ve fallen out of the habit, but I need a new, BIG bag to haul stuff around for work, so I’ll be digging into the home dec stash soon. *When you shop for fabric, what size cuts do you usually buy? 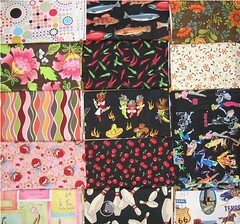 I’m on a fabric buying hiatus right now, but when I do buy it depends on the price of the fabric and how much I love it. For example, a local quilt shop occasionally marks their ancient fabrics as low as $2 a yard, and then I buy whatever is on the bolt for anything that I even remotely like. It’s great for quilt backs, and when it’s that cheap, it pays to stock up. For regular sales, I’ll buy 1 yard, maybe 2. 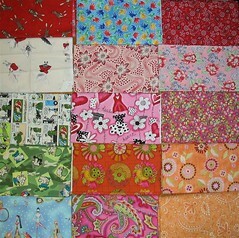 If I’m paying full price, I generally only buy 1/2 yard, maybe 1 yard if I really love it. *Do you buy on impulse or do you go out looking for something you need? Back to the fabric hiatus situation – I was a major impulse shopper, often triggered by a “need” for one thing. Now that the income is limited I shop only when I absolutely can’t find something in my stash that will work. 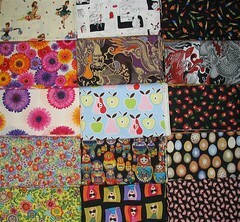 I have a monster stash, so I haven’t purchased much fabric in the last six or eight months. I’ve learned good habits – I have a gift card for a fabric store, and I’m actually having trouble using it! *Are you a pre-washer? If you are, do you wash your fabric before you need it, or only when you’re ready to use it? I do not pre-wash my fabrics. When I want to sew, I want to sew NOW and if I had to wait until I washed, dried, and pressed everything, I’d never sew a stitch. If I’d started pre-washing as I bought fabric, it might have been different, but there’s no way I’m going back through my stash now. Fortunately, I don’t have any problems with bleeding, shrinking, or physical reaction to the chemicals. I throw a Shout Color Catcher in with the finished quilt and keep my fingers crossed. So far, so good. I do, however, iron everything. I always square up my fabric before cutting, and I need to iron it to remove the creases. Sometimes I use a little spray starch. I keep my fat quarters separate from the rest of the fabric, and they aren’t really sorted. The yardage is sorted by color, then within each color by the color wheel – yellow, yellow-orange, orange, orange-red, red, etc. I usually give up about that time, so they aren’t sorted by value. There are a few “what the heck? 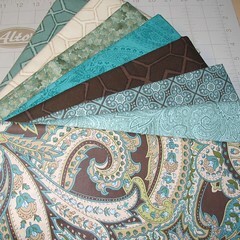 !” fabrics that are grouped together because I’m not sure what color they should be with. I also keep my solids, flannels and homespuns separate from the rest of the fabric. And Christmas fabric. Of course the home dec stuff is also separate from the cotton quilting fabric. 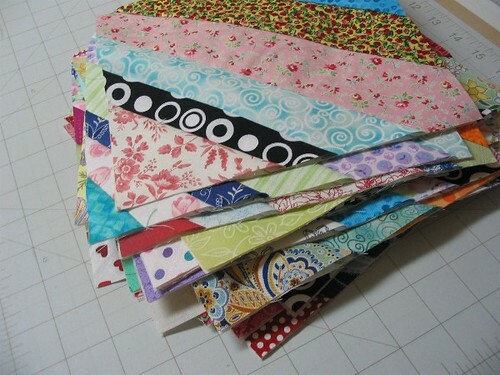 I split up fabric collections – I’m not tied to using “matchy” fabrics in the same quilt. * Do you have any special folding techniques? 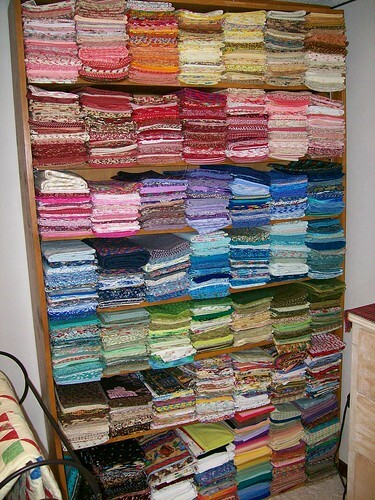 *How do you store your fabric? My fat quarters are in plastic totes, as is my non-quilting fabric. I know that plastic isn’t the best way to store fabric, but it’s what I have so for now it will have to do. My yardage is on a bookshelf that my dad made – five feet wide and about 6 1/2 feet tall. And yes, it’s full. Again, not the best fabric storage, but it’s in the finished basement so it isn’t exposed to much sunlight. * What tips do you have for building up a well-rounded stash? As I look at my stash, I realize that I have a ton of fun fabrics in medium tones, and nowhere near enough very light, very dark, and tone on tone fabrics. Try to buy at least one very light or very dark and one tone on tone for every medium print. Also, shop the clearance fabrics. 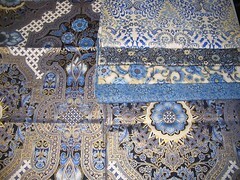 When it’s cheap it’s easy to purchase fabrics that you don’t love. That’s a good thing, because it forces you out of your comfort zone. I have some of the most gorgeous mustard prints that I never would have paid full price for. * When do you say enough is enough? I should have said enough was enough a year or three ago (and I’ve only been quilting for five years). I DID say enough is enough when finances dictated that I had no choice. Rule of thumb – if you’re spending more time buying, sorting, and petting your fabric than actually sewing on it, it’s time. * What are some of your favorite stash-busting projects? I like scrappy quilts. 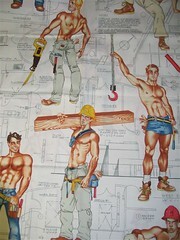 I like planned quilts. I like big projects, and little projects, and swaps, and giveaways. For now, all of my projects are stash-busting projects. I have promised myself not to spend any money on fabric for at least the next two years. (Notice I said “spend any money” – if I happen to receive a gift certificate for a fabric store, I am allowed to purchase fabric.) The best stash busting project I’ve worked on recently has been my string quilt. 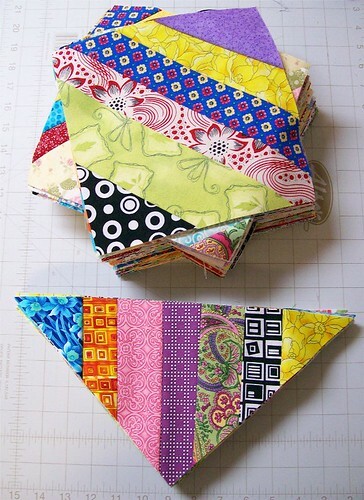 I cut strips from dozens of different fabrics and sewed them to muslin foundation squares. After trimming them to size, I’ll put them together using white sashing. * Do you have a current favorite print in your stash? Let’s see it! 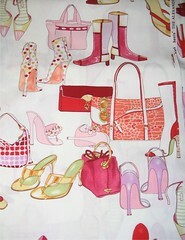 Asking me to pick one fabric print is like asking me to pick one favorite book. I like too many different kinds of fabrics to choose just one. Here are some of my favorites. 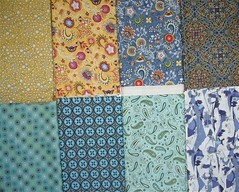 I like whimsy, so there are a lot of conversation prints, especially Alexander Henry. Oh, who am I kidding? I love it all! * What’s your definition of the perfect stash? I have an exceptional stash – I know I’m fortunate. With a little more very light and very dark fabrics, I’d call my stash perfect. I am dying of envy over here! Your organization is to-die-for! I only wish mine looked like yours. Hi there! Thanks for your comment today. I think that a swap would be kinda fun. It may take me just a little while to dig a few things out though. Get back in touch with me if you are interested! Can I live at your house??? I’m not jealous of your organization, i’m jealous of the amount and variety! I love that blue apples and pears the most. I want to swap! What a nice and neatly organized stash! I always show pictures of quilter’s stashes to my kids and then we critique them together-(I have to admit, we are a tough group and are not that easily impressed! )-but we all agreed whole-heartedly that your stash is amazing! You and your stash are welcome in our house any day! By the way, I was reading some of your older posts and read a reference to THE INCIDENT that made you cut back on buying fabric…so tantalizing! Could you dish? I am also on a sort-of,trying-to stop/cut-back on the fabric buying time right now and could use ANY tips that you have to help in this PAINFUL era! Thanks for the great pictures and post! THE INCIDENT is probably the best way to go on a crash stash diet. I was fired. Nothing like losing your job to make you realize what you can and cannot spend money on. I love my new job, but I’m paid MUCH less than I was at the old one. I cannot yet justify spending money on fabric, and I expect it will be years before I can. I have a great stash to work from, though! What a beautiful stash! I’m trying to tame mine….I love the string pieces. I have a bunch of scraps in a shoe box so I can do one! When I get around to it!